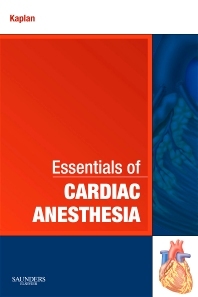 Authored by the same stellar editors and contributors responsible for Kaplan's Cardiac Anesthesia, this title presents today's most essential clinical knowledge in cardiac anesthesia in a practical, user-friendly format. A manageable size and affordable price makes this an ideal purchase for every clinician who would like an economical yet dependable resource in cardiac anesthesia. Provides the key cardiac anesthesia information you need to know by authorities you trust. Uses a concise, user-friendly format that helps you locate the answers you need quickly. Features key points boxes in each chapter to help you quickly access the most crucial information. Includes annotated references that guide you to the most practical additional resources. Features a portable size and clinical emphasis that facilitates and enhances bedside patient care. Contains the authoritative guidance of larger reference books without the expense. Chapter 11 Central Nervous System Monitoring, Harvey L. Edmonds, Jr.